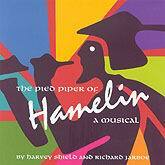 THE PIED PIPER OF HAMELIN By Harvey Shield and Richard Jarboe. Vocalists: Harvey Shield; John Hostetter; Jodi Mitchel; J. D. Ellis; Joey Sheck; Susan ; Holmes; Del Appleby; Lesley Sachs; Musicians: Alan Axelrod; Carl Sealove; Bob Forte; Sonya Edelman. This soundtrack is from the original version of Harvey Shield & Richard Jarboe's musical, "The Pied Piper of Hamelin", produced at the Olio Theater in Los Angeles in 1984. It's original title was "1284". 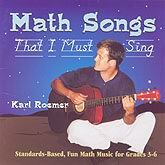 MATH SONGS I MUST SING - Karl Roemer - Tracks: Think in Groups of Three; The Song That I Must Sing; The Multiplication Facts Doubles Song; A Skill Not To Lose; If You Wanna Orders and Compare Any Numbers; Percent and the President; To Formulate Helps to Calculate; etc. Recommended for kids in grades 4-6. Fun songs to make difficult tasks easy as a game.